It’s not possible to create a successful and valuable veterinary education tool without the support of academia, and likewise it would not be possible for us to produce EasyAnatomy without the involvement of the three anatomy professors we are so fortunate to call part of our LlamaZOO team. Dr. Terri Clark, Dr. Susan Dawson and Dr. Corinna Klupiec have each experienced veterinary and anatomy education as educators, and as students. They have intimate knowledge of the challenges and frustrations associated with the subject matter, but they have also learned strategies and practices that can be highly effective too. Dr. Clark, Dr. Dawson and Dr. Klupiec have devoted their careers to veterinary education in general, and veterinary anatomy in particular, and now they have dedicated themselves to making EasyAnatomy a breakthrough advancement in veterinary education. With their deep understanding of both the tool and its target space, there are few who have a better understanding of the impact EasyAnatomy will have on veterinary education. Whether related to the introduction of groundbreaking quality 3D models, or to the development of a universally adoptable tool, EasyAnatomy will make an impression – and the better we understand the application and how it is being developed, the better we can prepare for and maximize its future value. 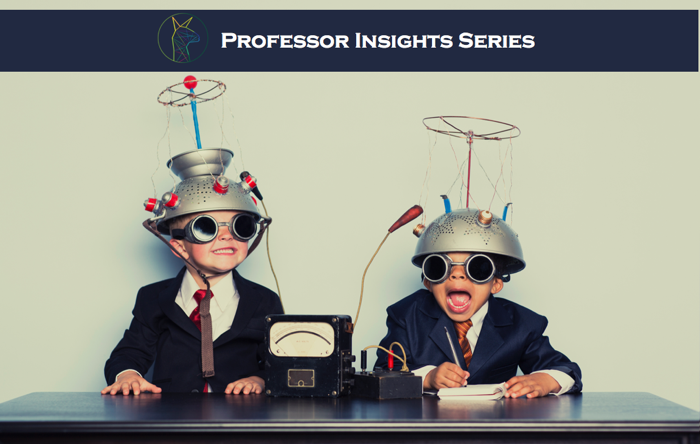 With that in mind, we would like to introduce a new series to the LlamaZOO blog, called “Professor Insights”. This series will feature behind-the-scenes glimpses into the minds of our three professors; their thought process in developing written content and quiz questions; things they have discovered along the way; and the value they see for fellow educators (and for students) in adopting EasyAnatomy. So without further ado, let’s get started on the first topic in this series: Nomenclature. Q: How did the anatomist team decide on the nomenclature to be used in EasyAnatomy? Dr. Clark: We came to a mutual agreement to attempt to go with the most commonly used terms in North American schools. Many structures are typically referred to using Nomina Anatomica Veterinaria (NAV) terminology. Some structures, however, are more commonly referred to by anglicized terms. We considered what terms students would most likely encounter in their anatomy classes as well as in other courses in the veterinary curriculum. Dr. Klupiec: The decision process involves a lot of thinking and discussion between the three of us, and we come to a consensus on what works best between anglicized and NAV for a given structure. Dr. Clark: It’s important to note that we are including the NAV term for every structure in the model within the description. Dr. Dawson: EasyAnatomy is a comprehensive resource: it is as useful for students (to prepare for and review for lab) as it is for instructors (to design and deliver lessons). The nomenclature needs to be accessible for both groups. Dr. Klupiec: As anatomists, we know that when you first see a structure labelled in a non-familiar way you initially get thrown off, but that’s ok. People might notice the differences, but as you spend time with the app you realize how secondary those issues really are – and you always have the compass of both the anglicized and NAV in the description, which gives everyone a reference point they can acknowledge. Dr. Clark: Even if a class typically teaches using different nomenclature, there should be no issue in using EasyAnatomy. Q: How does the nomenclature in EasyAnatomy compare to Miller’s Anatomy of the Dog? Dr. Clark: The two are actually quite consistent. Miller’s typically uses the NAV terminology in its text (e.g. m. supraspinatus) while we chose to list the name first and then the type of structure (e.g. supraspinatus m.). For some structures, muscles in particular, we have chosen to use the anglicized name (e.g. common digital extensor m.) instead of the NAV term used by Miller’s (e.g. m. extensor digitorum communis). Again, we made our decisions based on what students are most likely to learn and use in their anatomy classes and other courses. Dr. Klupiec: One very specific example of a challenging scenario was the “articular process joint”. In common usage, particularly in human anatomy, this is called the facet joint, but that term is just not used in Miller’s at all, nor is it commonly used in veterinary textbooks in general (there is really no other equivalent name in common usage). The only alternative Miller’s puts forward is even more complicated, so in the end we went with the simplest of the options in Miller’s, even if it sounds a little awkward. I think the reason such an obscure example comes to mind for me is because EasyAnatomy and Miller’s really are quite similar in their nomenclature. Dr. Clark: For the muscles, we decided to differ from Miller’s to instead address the way students are typically learning them, and the way clinicians will use the terminology too. We think it’s important to put equal weight on both anatomists and clinicians, and have done so. Q: Have any major differences come up with you each being from a different country (U.S.A., Canada and Australia)? Dr. Klupiec: Yes, they correct me all the time! Dr. Clark: There haven’t been too many, other than different spellings of anglicized terms, and we decided to go with American spellings. Dr. Dawson: There are spelling differences between North American and British/Australian references. The esophagus and the oesophagus both refer to the same structure! Once a student has mastered the language of anatomy, it is obvious that they are the same, but for a novice learner, it can be confusing. Keep in mind that veterinary students and veterinarians will read scientific journals from different parts of the world, and they will need to understand those differences in spelling. Dr. Klupiec: In seriousness, people will be able to identify EasyAnatomy as having a North American origin due to spelling, but this is not an obstacle to learning for students outside North America. You could have lengthy discussions about differences in nomenclature over a glass of wine, but in the end it’s really secondary, and it’s important to keep that in mind. Dr. Dawson: Students can often get hung up with terminology and think that anatomy is just about names. But the bigger picture of anatomy is what structures are and how they fit together. EasyAnatomy addresses both: it shows proper nomenclature, but more importantly let’s students figure out how things fit together.